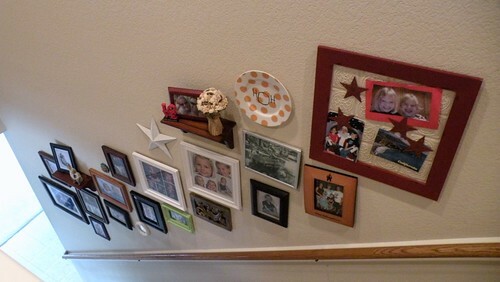 I’ve finally added some pictures and fun accessories to my stair wall! If I can’t rip them apart and build amazingly awesome new ones, I can at least decorate the walls! Okay, so here’s what I started out with. Don’t they just look SO inviting? Man, these stairs really make you want to just, well, go up them! Don’t they!? Who am I kidding? This staircase is so dark and dungeon-like as well as just plain boring. I never want to go up there! So in an effort to make myself want to actually use the top half of my home, I decided some wall art was in order. I pretty much gathered up every photo I own that can hang on a wall and went to work. First, I sorted them out nicely on the staircase so I could see what I was working with. I took the biggest picture in my collection and hung it first. I wanted it low enough that I could easily see it from our family room because I just love it so much. 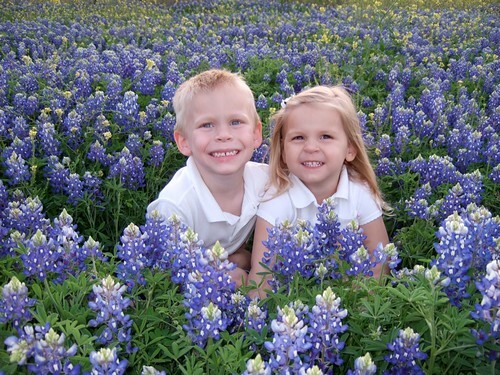 These are my kiddos in 2007. Our boy was 5 and our girl was 3. Oh my they have grown so much since then! Then I just started working my way up the staircase with a pile of nails and a hammer. I’ve seen so many people map it all out in advance, cut squares of paper the exact size of all their frames, tape them to the wall, move them around, etc… BUT I am just nowhere near patient enough to do that! I pretty much just grabbed a picture I thought would look good in a blank spot and eyeballed where the nail should go. If I didn’t like where it ended up, I’d take the nail out and move it an inch or so and re-hammer the nail back in. I did try to hang all the biggest pictures first though and I made sure they were spread out up and down the entire wall. Then after that I added the smaller ones in the leftover holes and gaps. After ALL the pictures were hung, I hunted down some accessories to add to the ensemble. Before I started I thought I’d have way too many pictures, but once they were all up on the wall they looked so sparse. So in an effort to fill all the extra gaps as well as add more texture and dimension to the wall, I added some accessories and shelves. 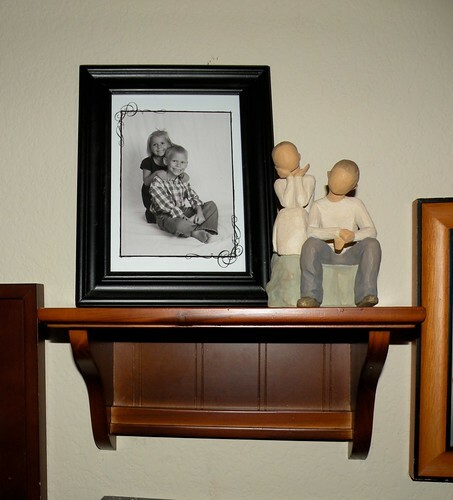 I LOVE the Willow Tree Sculpture paired with the picture of my kids. LOVE IT. I am NOT a collector. In fact, I really don’t like knickknacks and chachkies at all. But I do like a few pieces here and there as a statement piece. But if I ever end up with 10 Willow Tree sculptures, I swear I’ll hate them. Okay, funny side note about the sculpture… Have you ever seen the episode of The Simpson’s where Homer buys Marge a birthday gift and when she opens it up it’s a bowling ball with the name “Homer” inscribed in it? Oh my, that is one of my favorite episodes. So funny. I told Ben like 9 years ago that I wanted a Willow Tree sculpture. Well, after waiting for about 7 years for my gift, I finally just bought myself him this Willow Tree sculpture for Father’s Day two years ago. He laughed and laughed when he opened it because he knew I really bought it for myself. And now he calls me Homer. Maybe this is too eclectic or chaotic for your taste, but seriously?!! The red frame with the stars is a magnetic board, so I can switch out pictures frequently. I don’t know if I like the plate more, or the picture of “us”. That picture of hubbs and I was taken in 1999 when I was 19 and he was 22. We were such young kids! Oh, and the three black&white boys in the corner? The upper two are my nephews and the baby is my little man. This picture is from 2002 during my SIL and my “painting black&white photos phase”. I bought the two matching shelves from TJ Max on clearance for only $5! I wasn’t sure where I would put them considering they are quite small and would look odd on a large wall. I think they look great mixed in with all my photos on the stair wall! And I love the LOVE chachkie because, well, it’s just so cute! And also because we actually bought it in Philly when we took a trip there so it’s got some sentimental value as well. I really should frame the picture hubbs and I took sitting inside the “LOVE” and put it next to the little chachkie. The photo wall is mainly filled with pictures of the loves of my live – my kids. But I do have some neices and nephews & Aunts and Uncles mixed in as well. I really had a great time hanging all these photos. In our day in age, it’s easy to leave all your photos on the computer and never look at them. I’m glad I have some actually printed out and framed so that I can see them and smile every single day. My new goal now is to go back through the past 10 years of photos and print some. I need more framed photos around my house. Seeing them really does lighten my mood and brighten my day! 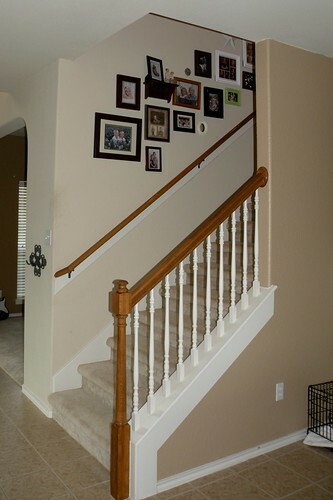 Have you updated your staircase with pictures, artwork, or anything else? Share it with us by posting a link in the comments section! Your wall looks fabulous! 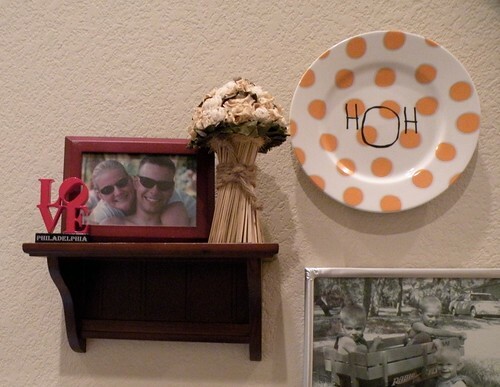 I love all the “extras” you worked in, ESPECIALLY your HoH plate! Too cool! Great job with hanging the photos. I love the two little shelves also! You know, someone gave me one of those “Willow” figures of a Mother and Son and, although I usually don’t go for things like that, it is one of my most prized possessions, due to the fact that it was given with love, and with my son and I in mind. So I can see why you love the one you have, representing your son and daughter. I love your pictures.You did a great job! Eyeballing is how I always hang stuff too! This was a great read, thanks for sharing! Looks fantastic and your kids are adorable! I love that nothing matches, and yet everything matches. It looks so inviting now! 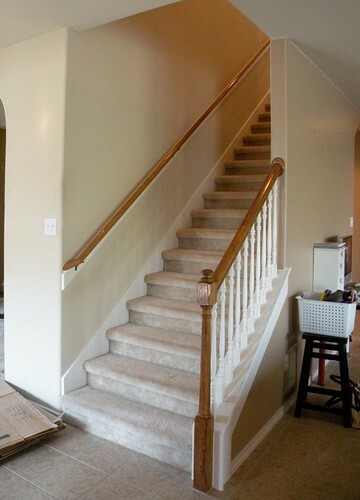 Your stairway looks great! Love the shelves!! It gives the wall much needed dimension! 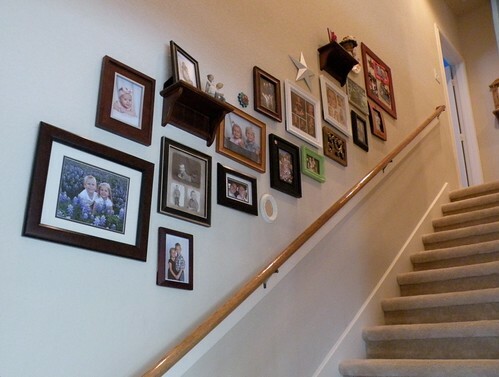 I have a long hallway…so we put in niches on one side and filled the hallway with pics and such. Turned out great! We also had the hallway plastered which gave some nice texture to that area. You did such a great job – it looks amazing!! 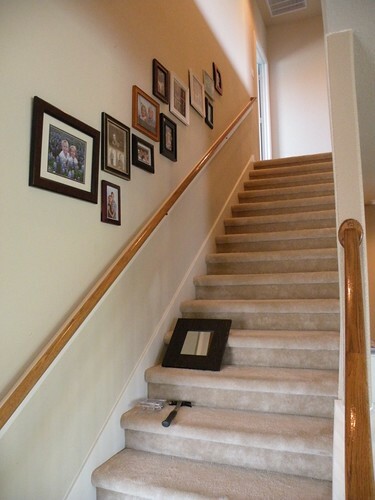 I need to do something on the walls by our stairs too – wasted space that could look so cute! Hope you have a great weekend! That came out really great! In our old house we had a photo hallway where the walls were lined with framed pictures. I need to dig those out again and hang them on our stairwell… you’ve inspired me! Nice job!! It looks great and it’s good that it’s not to matchy matchy. I love the magnet board that you can switch out. I love to switch things for the holidays. 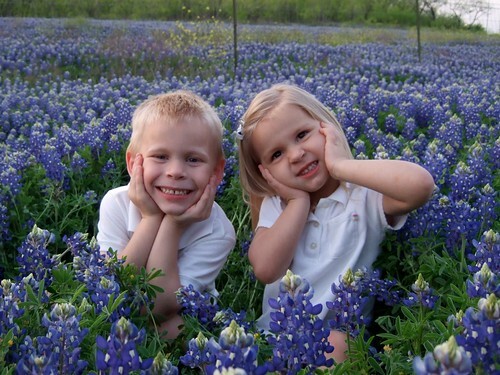 Are those blue bonnets the kids are sitting with? I we to Texas, once, in the Winter (I thought CA had wierdo weather) and my friend said you should see the blue bonnets. Ok I’m writing too much but I wanted to add… I created a slide show of Halloween photos that is worth (in my opinion) looking at. Love the wall! Mine looks like that too. And I don’t measure and plan either. It is an ever growing project, too. I keep adding, but I love it. Great job, and lovely pics! 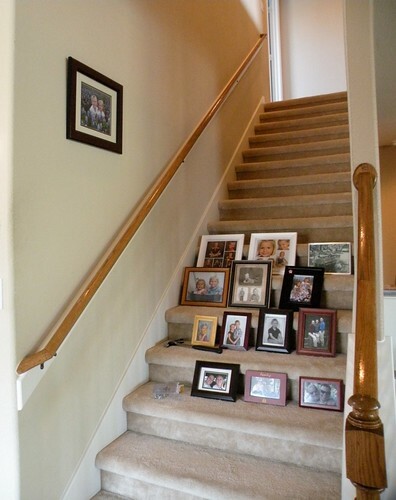 I LOVE the idea of putting photos in the stairway. I need to do this in our house, the stairs ECHO in our house, lol. (Partly b/c we don’t have carpet on them now). I have loads of photos, but just can’t decide on what kind of frames…all one color, or not? sighhh…. 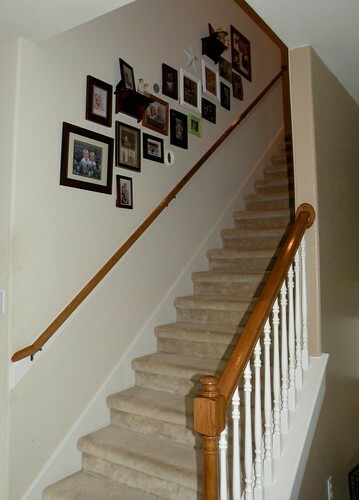 Love the stairway – it really does invite you up the stairs. I think it’s great! Wish I had the eye to do my own! Love it; wish I had a staircase, lol! I was a little skeptical at first with all the different frame finishes but you made it work. Nice job! I might give this a try on my blank staircase wall but I think I will use the Command strips instead. Love how you mixed photos with other fun stuff! I’m like you ~ no patience for measuring, mapping or planning. I think it turns out better when you just “do”! 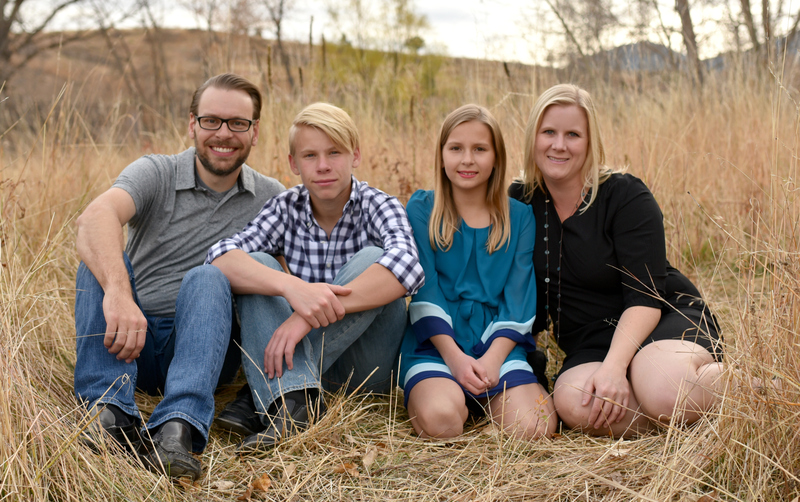 Oh, and that last photo of your kiddos? Adorable!